Objective: Help a rural population install solar street lamps in key locations around the island. Funding Partners: Atelier Ten Foundation, Parsons School of Design, USAI Lighting, Bartco Lighting, Lumenwerx, Mercury Lighting, etc. Interested in funding the installation of solar street lamps, contact us here. It’s easy to take energy for granted, forgetting that throughout much of the world, a lack of power affects everything from business to education to matters of life and death. Approximately 1.5 billion people still don’t have access to electricity worldwide. By using the power of the sun — the ultimate natural resource — these issues can be ameliorated, if not solved. In 2016, Roots of Development and a group of graduate students from Parsons School of Design teamed up with Roots’ community partner (APDAG, The Professional Association for the Development and Advancement of Gran Sous/La Gonave) to carry out a solar street lighting initiative on the island of La Gonave. 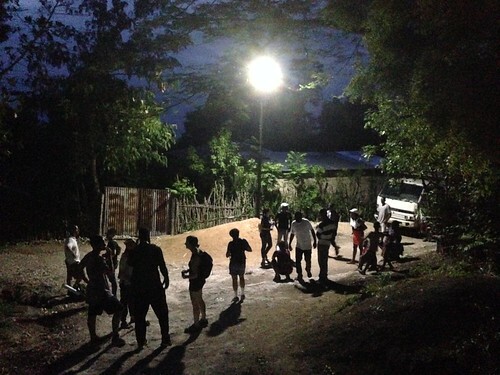 Under the direction of their professor, and professional lighting designer Chad Groshart, the graduate students researched best practices in the developing world and proposes (and helped to deliver) a solution to La Gonave’s lighting needs. The solution was based on APDAG’s guidance and on technology that was already available in Haiti. With the exception of one town (the port town of Anse-a-Galets), the majority of La Gonave’s towns and villages are not connected to any sort of power grid. Most residents live with no electricity at all. This affects business, education, and almost every other aspect of life on the island. We will be building on the success of the solar street lamp installations that took place in 2016 and 2017, to bring new solar lighting solutions to more communities and another incredible learning opportunity to a new group of Parsons students. This year, we will be partnering once again with Parsons School of Design in New-York City. For a third year in a row, we will be helping local leaders on La Gonave light up a key location using all solar energy. The installation will take place in May in Anse-a-Galets, La Gonave’s largest town and main port of entry. We will be working directly with the Mayor‘s office to identify the location and organize residents around the project, as Roots of Development ensures as always that the local population and officials make their own decisions. The first one concerns the largest public square of the town. It was recently renovated, but in order to make it available for residents at night as well, a working lighting system is necessary. The square will then be a real public space where residents can gather anytime to talk, read, study, where merchants can sell their goods. It will also be used for public gatherings and large town celebrations. With a solid lighting design plan as well as a reliable source of energy, the square will be able to reach its full potential! That’s where Parsons’ role comes into play. The second potential site concerns a new walkway that is currently under construction at the wharf in Anse-a-Galets. Visitors and passengers arriving by boat will walk on one (covered) side of the wall, while products and goods being loaded and unloaded from the boats onto trucks will be handled on the other side. In order to receive visitors to the island appropriately, sufficient and sustainable lighting is crucial. If you are interested in getting more deeply involved, let us know! You can contact us here. In May 2016, this partnership resulted in the first installation of a set of solar street lamps in key areas around the community of Gran Sous. Our local community partner, APDAG, held multiple community meetings during the planning phase of the project. During these meetings, the community asked questions, voted on the locations where the lamps would be placed, decided who would contribute to the local resources needed to install the lamps. On the morning of the installation, residents were digging holes and mixing concrete by 5 a.m. By noon, all five solar street lamps were up and running. Shortly after the installation of the lamps, economic and social activities sprung up at nighttime. For more information about the previous installations, check out the Roots of Development blog posts Help us expand this initiative and install more solar street lamps throughout the island. Raise funds or make a donation today! Any questions, contact us or Chad Groshart at chad.groshart@atelierten.com. For more information about the previous installations, check out the Roots of Development blog posts about the 2016 and 2017 installations.